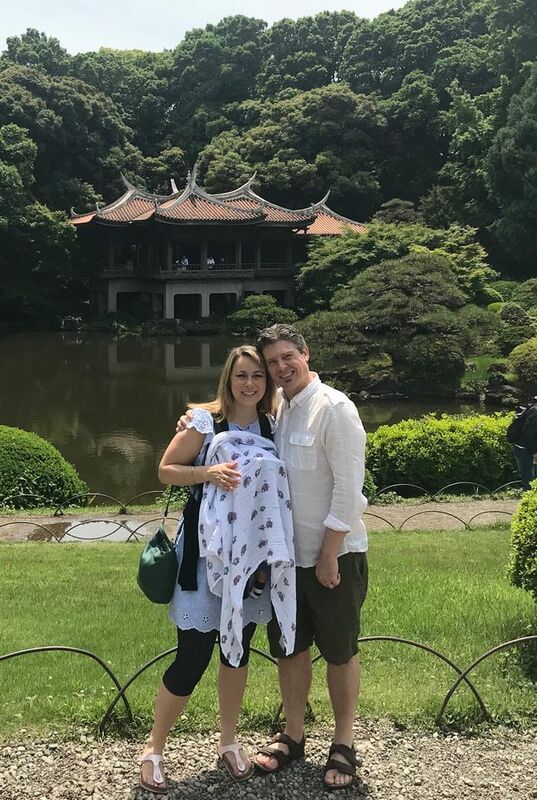 Lee Fodi and wife Marcie Nestman are pictured in Japan with the child they hope to adopt. The B.C. government has temporarily suspended adoptions from Japan amid uncertainty over a recent directive from Japan to the United States on international adoptions. The suspension comes as five B.C. families in the process of adopting children from Japan have been forced to stay in Tokyo for weeks longer than expected because the Canadian government is reviewing its policies. Some family members have returned to Canada because of work and family obligations while others have remained in Tokyo. For the parents, the delays in obtaining visas for the children – who include babies as young as three months – have resulted in financial and emotional strain and left them wondering why their plans have been upended by procedural requirements in another country. “We followed every due process that was put before us,” Lee Fodi, a Vancouver resident, said on Monday in a call from Tokyo. “This process has been working for 10 years ... so everything is the same, except that suddenly, some red flag shot up and everything screeched to a halt. And we’re stuck,” he said. Mr. Fodi and his wife travelled to Japan in April, expecting to spend a few weeks there before bringing their adopted son home to Vancouver. On April 13, the U.S. Department of State issued a bulletin that it was “reviewing Japanese law regarding the transfer of custody of child without a court order” and recommended that adoption agencies not make new referrals to prospective adoptive parents in the United States. That change caught the attention of the Canadian government, which has sought a legal opinion to determine if it would affect the process for Canadians seeking to adopt children from Japan. “The government of Japan has recently informed the United States government that under Japanese law, the courts must authorize intercountry adoptions. This has not been part of the process for Canadian families adopting children in Japan,” Nancy Caron, a spokeswoman for Immigration, Refugees and Citizenship Canada (IRCC), said on Monday in an e-mail. Canada is seeking clarification from the Japanese government, she said. It is treating the issue as a priority but until further investigation, IRCC cannot process cases that are not confirmed by court order. “Our hearts go out to the prospective parents, who have travelled to Japan to adopt children. We understand and sympathize with their very difficult situation, however IRCC must respect its obligations under international and Canadian laws which is in the best interests of the children involved,” Ms. Caron said. In a statement, the B.C. government said it suspended adoptions from Japan as it seeks “legal clarity” on the issue. It is not clear what other provinces are doing. The procedure that Mr. Fodi and other parents were following has been in place for at least a decade, said Vancouver lawyer Alex Stojicevic, who is representing the five families who are now in Japan. Those families have been unfairly caught up in procedural uncertainty, he said. “The Japanese government has not contacted Canada – if they had an issue with these five adoptions, why have they not contacted Canada directly?” Mr. Stojicevic said. Mr. Fodi said the uncertainty is draining but that he and his wife are trying to focus on bonding with their three-month-old son even if they don’t know when they might be able to bring him home. “It is hard, especially in the middle of the night – you don’t know where you are going to be,” Mr. Fodi said.